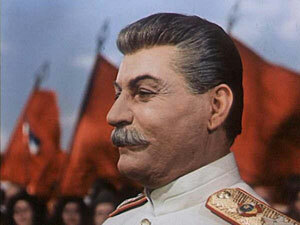 He led the Soviet people fearlessly. The Georgian director Mikhail Chiaureli’s The Fall of Berlin is perhaps the most important of the films that promoted Stalin’s “cult of personality.” Made in two parts by Mosfilm Studio and presented to Stalin as a 70th birthday gift, the film lasts over 150 minutes. It begins in the countryside near Moscow in June 1941 and ends with a highly fanciful victory parade attended by Stalin in Berlin in May 1945. The linking thread is the interrupted love affair between Natasha (Marina Kovaleva), the village schoolteacher, and Alesha (Boris Andreev), the Stakhanovite steelworker and recipient of the Order of Lenin for his achievements. She is captured by the German invaders and schlepped off to a concentration camp; he, shell-shocked during the invasion, recovers when he hears of her fate, and fights his way westward in the Red Army to liberate Europe. They are reunited in the final sequences of the film, but only recognise one another (well, it has been almost four years, and even undying love has its limits) in the context of their “unforgettable encounter” with the Great Leader Himself. No expense was spared in the making of the film. Captured German tanks were refurbished and reused, a huge cast was deployed, and the final scenes were shot in the actual ruins of the German capital, although Stalin’s descent from the heavens is apocryphal! Indeed, there is anecdotal evidence that he found the film so persuasive that he wished he had flown to Berlin to celebrate “his” victory. The role of Stalin was played by his fellow Georgian, Mikhail Gelovani, who had been specialising in the role since the mid-1930s. Gelovani was famous for the precision with which he reproduced Stalin’s gestures and his Georgian accent when speaking Russian. Dmitrii Shostakovich was commissioned to write a largely bombastic score, parts of which he later reused in his Tenth Symphony to depict Stalin. 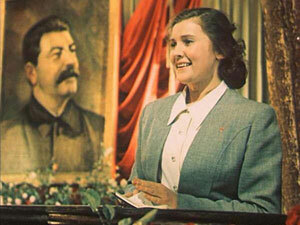 The film presents Stalin for the first time as a leader of the Soviet and world proletariat in his own right, with only one reference, in the final chorus, to Lenin. Stalin’s world role is justified by his achievement as saviour of humanity and civilization from the Nazi threat in his capacity as war leader and strategic genius. 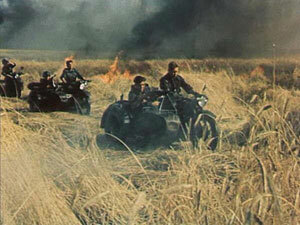 The film was originally made in not-so-glorious Sovcolor, actually German Agfacolor, captured from the UFA studios in Neubabelsberg by the Red Army as war booty in the conflict that the film so heroically depicts. Some of this precious film stock was also used by Eisenstein for the dance sequence in the second part of Ivan the Terrible (1945; released 1958). Because of its content, The Fall of Berlin was withdrawn from circulation after Khrushchev’s “secret speech” to the delegates of the 20th Party Congress in February 1956, in which he denounced Soviet cinema’s role in the Stalin cult. Some years back the film was restored with the help of the Cinémathèque in Toulouse and this version has been in circulation on VHS with inadequate subtitles for some time. International Historic Films in Chicago has now made a better restoration, using digital technology to iron out the inconsistencies in the original, somewhat erratic Sovcolor, and the subsequent wear and tear, and this version is now available on a region-free DVD, subtitled to a high standard. There is a bibliography and a truly excellent slide show placing the film in its political, historical, and cinematic context, which should serve as a model for the treatment of other historically significant films. Unfortunately the restored DVD version still omits the famous “missing scene,” in which Stalin takes Alesha into his dacha to meet the Politburo and to ask the steelworker’s advice about how best to conduct the impending war. It may be that it was destroyed after Stalin’s death because it depicted Lavrentii Beria, but there is anecdotal evidence that the scene has survived in a version circulating in Germany in recent years. Since the film does not make complete sense without it, a translation of the script for this missing scene, Scene 13, follows this review. At the table—Comrades Stalin, Molotov, Kalinin, Malenkov, Beria, Voroshilov, and Alesha. The table is already laid. There are no waiters. Everyone takes whatever he wants. Ivanov [that is, Alesha], so as not to put a foot wrong, eats only bread. Stalin says to him: “When a guest doesn’t eat, the host feels hurt. Try this.” He places a fish on Alesha’s plate and pours him a glass of wine. “Thank you. To your health, Comrade Stalin,” says Alesha. “A lot of people make steel, but many of them think about what it’s for or how much we need... What do your people think about war?” asks Molotov. “They think it’s on its way, that it’s imminent,” Alesha replies. “And will you give up then?” asks Voroshilov. “And it’s not really like that?” asks Stalin, smiling. “Tell us, tell us,” says Stalin, pushing Alesha’s plate towards him, but Alesha, not noticing, pushes it away in the rush of his impassioned eloquence. 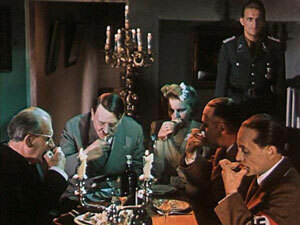 They all leave the table and gather round Stalin and Alesha as they continue their conversation. “Are you married, Comrade Ivanov?” asks Molotov. “Almost ... married, but it won’t work out. 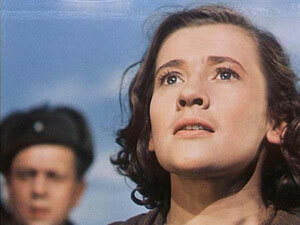 Please help me if you can, Comrade Stalin,” Alesha replies, sighing with embarrassment. I stand above the snows on the edge of a ravine. Hovers motionless on a par with me. “Do you study this as well?” He expresses his astonishment and his face shows his unhappiness. Stalin lays his hand on Alesha’s shoulder. “You can trust us steelworkers,” he tells Stalin. “We won’t let you down. We’re miles ahead of all those foreigners. I’m telling you straight.” He leaves, but turns back. “Thank you for everything, Comrade Stalin.” He shakes his hand. “Thanks!” And he quickly leaves the dining room. 1] An extract from the final chorus in The Fall of Berlin. 2] Source: V. Kozhevnikov, G. Mdivani, M. Smirnova, M. Chiaureli, and A. Shtein, eds. Izbrannye stsenarii sovetskogo kino v 6 tomakh. 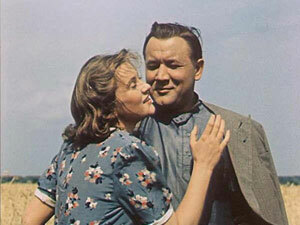 Tom 6 [Selected Scripts from Soviet Cinema in 6 vols. Vol. 6]. Moscow, 1951: 19-21. 4] This extract is from Pushkin’s poem “The Caucasus,” written in 1829. The double significance lies in the fact that it described Stalin’s birthplace, Georgia, but also that Stalin the Georgian should be so familiar with the verse of the great Russian poet. 5] Stalin’s own wife, Nadezhda Allilueva, had committed suicide in 1932. Cast: Mikhail Gelovani, Boris Andreev, Marina Kovaleva, Vladimir Savelev, Iurii Timoshenko, Nikolai Bogoliubov, Sof'ia Giatsintova, Viktor Stanitsyn, Oleg Frelikh, and many others. DVD distributed by International Historic Films Inc., Chicago IL, 2006.